Howard Edward Cross, Jr. (born August 8, 1967) is a former professional American football tight end in the National Football League. Cross played football at New Hope High School in New Hope, Alabama. In college, he was a member of the Fellowship of Christian Athletes. He was drafted out of the University of Alabama in the 1989 NFL Draft by the New York Giants in the sixth round. Over his career, Cross played in a total of 207 games as a Giant, more games than any other player in team history. Cross won a Super Bowl ring with the Giants in Super Bowl XXV when they defeated the Buffalo Bills 20-19. He was the only player on both the 1990 Giants team as well as the 2000 team that lost Super Bowl XXXV to the Baltimore Ravens 34-7. Although he was known more for his blocking expertise, he finished his career with 201 receptions for 2,194 yards and 17 touchdowns. After retiring, Cross moved into broadcasting. 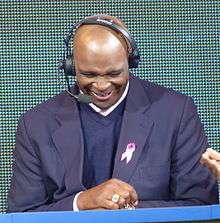 He is currently a co-host of the YES Network's This Week in Football, as well as serving as color commentator alongside John Sterling on the network's Ivy League football telecasts. Cross is also a sideline reporter for the New York Giants Radio Network. He has also spent a great deal of time working with youth to help ensure that they stay in school. He currently resides in Northern New Jersey. Howard is currently a real estate broker for Cresa NY. Cresa is a tenant rep firm. 1 2 "Howard Cross NFL Football Statistics | Pro-Football-Reference.com". pro-football-reference.com. Retrieved 2016-05-18.